Lesions on the skin of the feet can be a wide variety of conditions. It's important to talk to your foot doctor if you notice a new lesion, even if it isn't painful. There are many different skin lesions that can present on the feet. Some are completely benign and look that way, while others can seem like nothing and be a big deal. These lesions can be very tricky since they can look similar to each other at times. This article is here to provide some direction when you notice a new lesion on your foot. There is also some basic information that you can provide that will help your doctor to better assess your condition. When you first notice a lesion on the skin, there are some findings that you should take note of. When a doctor looks at a lesion on your skin, they are looking at the size, borders and colors. They will also ask you how long the lesion has been present and if the size, borders or colors have changed. It is also vitally important to know if the lesion is painful/non-painful or if it has ever opened and drained or bled. 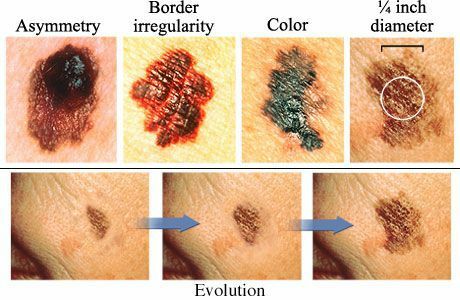 Lesions considered benign are typically smaller than 1cm in diameter, have regular round borders and have coloration that is consistent throughout (brown versus black/brown/red mixed). They also typically are not painful and do not bleed or drain. They do not change size or shape over time to any appreciable degree. The lesions on the skin that are concerning are just the opposite; large, multi-colored, wavy irregular borders, painful, occasionally draining or bleeding. Now, just like anything else, these findings are not always clear-cut. Sometimes a lesion can have characteristics of a benign lesion and other characteristics that are suspicious. * Nevus: A nevus (plural nevi) is what people commonly refer to as beauty marks or birth marks. These lesions are benign, well circumscribed and can appear in a few different colorations, depending on their type. There are vascular nevi (also known as hemangiomas), which are reddish in coloration and are also called strawberry marks. Another type of nevus is the melanocytic nevus which is brown colored and made up of melanocytes which are the cells responsible for skin color. * Corns, calluses: We refer to these as hyperkeratoses. These result from pressure and friction to a particular part of the foot and appear as raised, hard skin. They are usually painful in shoes that do not acommodate for them, due to increased pressure. Conservative treatment for these can include occasional trimming (performed by a podiatrist), creams to decrease the amount of excess skin that grows up, and padding of shoes/inserts or custom orthotics. 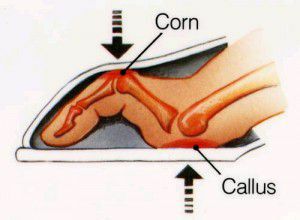 There is surgical treatment for calluses and corns, but it is not to physically remove the callus. Rather, surgery can be utilized to correct foot deformities that predispose the skin to excessive friction or pressure that is the root cause of the callus or corn. For instance, corns on the tops of the toes are usually caused by hammertoe deformity which can be surgically corrected. 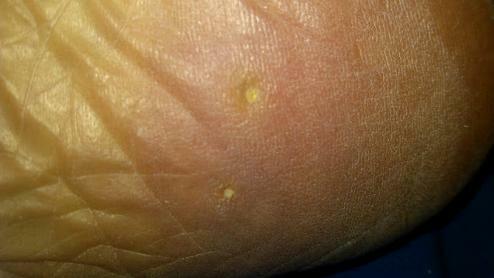 * Porokeratoses: These are similar to calluses, but have a deep core of thickened skin built up. Similarly to calluses and corns, these can also be caused by excessive pressure on an area of the foot. It is believed that these painful calluses are due to a clogged sweat gland on the foot. These are often mistaken for plantar warts and are typically painful to walk on and described as feeling like "walking on a pebble." * Verrucae Plantaris (ie. plantar warts): These lesions can easily be mistaken for a callus at first appearance. Plantar warts are caused by a virus and in order to 'feed' these lesions, the body creates small blood vessels to the area. This is what makes a 'classic wart' presentation on the feet. When these lesions are trimmed by your doctor, there are small areas that bleed and this tells us it is a wart. These small blood vessels are sometimes evident as tiny black dots within the callus. Read more about treatment of warts on our blog! * Subungual hematoma: This is a condition of a toenail when there is bleeding beneath the nail that can be seen as a dark brown or reddish discoloration. These very commonly occur in long distance runners and also basketball players, due to chronic pressure to the nail. 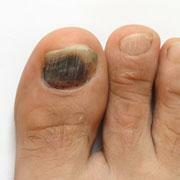 These can also occur when an object falls onto the toe and damages the underlying tissue or if the toe is stubbed. When subungual hematomas are due to a traumatic incident, they can be a sign of underlying fracture to the toe and should be assessed by your podiatrist. If these are addressed quickly enough they are easily drained and pain from the pressure of excess fluid on the toe is relieved. * Malignant Melanoma can occur on the feet, especially in individuals who are fair-skinned, are red-haired, are blonde, freckle easily or with a history of blistering sunburns and numerous moles at a young age. This is a dangerous condition because often times when the surface of the skin demonstrates changes, the cancer has spread farther than the visible area under the skin's surface. It is vital to watch any 'moles' for changes or growth over time. Malignant melanoma can occur at any age. If you have a questionable lesion, visiting your podiatrist can help lead you in the right direction if the lesion truly is suspicious for melanoma. There are so many more skin lesions that can commonly present on the feet. The most important message is to notice and monitor any skin color changes or moles that seem to enlarge, change, or become painful. If you have concerns about a lesion on your feet, make an appointment with one of the doctors at Prairie Path Foot and Ankle Clinic today!